The big little boat. A all-rounder. A high level of stability, load-carrying and reserve buoyancy and can be towed on a trailer easily by any family car, which makes these very useful, all-rounder crafts. Full length storage shelves along the sides for tackle or whatever. The sealed deck is drained by two screw-in duckbill scuppers. They have removable and movable seat and the anchor locker has good capacity. The hull is a nice soft traveller, comes onto the plane easily and the centre console top helps protect the electronics and the helmsman. 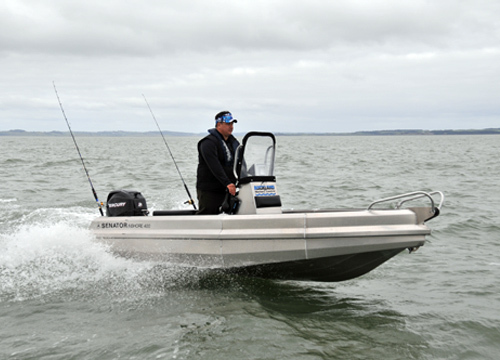 Useful two-man inshore boat – great for tasks such as fly-fishing or soft-baiting with plenty of workspace and performance.